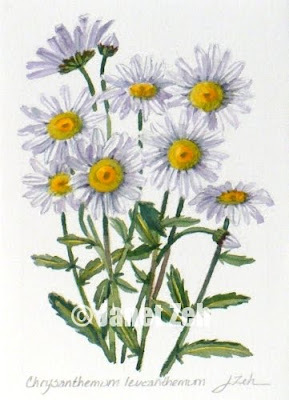 Wild daisies are popping up everywhere and they were begging to be painted! I always leave the wild daisies that I see growing on the edges of the lawn. It's good for the butterflies and bees to have some native wild flowers in addition to whatever has been planted in the garden. For this piece, I clipped a few to bring into the studio to paint.